A dog with an illness threatening his life has been taken from a Coventry dog shelter. A man masquerading as a potential owner for Chippy, a mixed breed Mastiff, took him last week from the RSPCA situated on Coundon Wedge Drive around mid-day. He requested that he take Chippy for a walk, and left a bike and a set of keys as security. However, he disappeared with the sick dog. If you saw 30 riot police, armed officers, a veterinarian specialising in lions and the RSPCA rushing to an incident, you would be forgiven for thinking that it was all going down at a circus, possibly involving Eastern European terrorists and Bruce Willis in a blood-stained vest. However, this massive police operation was to tackle two dogs that had bitten a teenager. The two mastiffs had turned on 19-year-old Daniel Boardman and were in the act of biting him on the arms, legs and posterior when the police arrived. For many years now video games have been blamed for a spate of violent incidents in society, from murders and rapes to bullying in the playground. Yet, in all of the years of the media casting the blame on video games (and away from the degradation of society as a whole) one video game platform has never come under fire… the Nintendo DS. 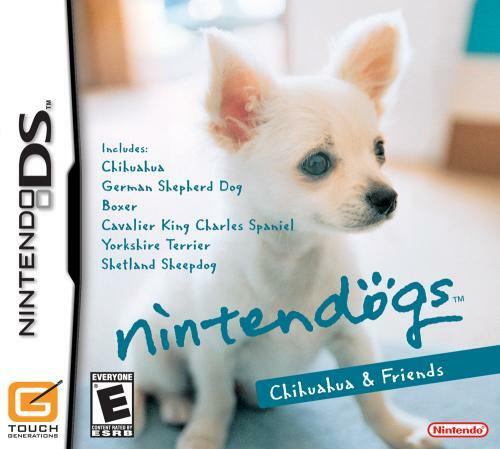 That has all changed now as the Nintendo DS, and the happy children’s game Nintendogs, has been blamed by a grandmother for a dog’s attack on her granddaughter. A video game responsible for making a dog attack a little girl? Surely this is ridiculous? Yet, The Daily Mail has proceeded with the story as though the game were to blame for the incident. Continuing our week long list of lists, today we turn the spotlight on singers. It’s funny old life being a rock star or a member of a band. When you’re not holed up in a studio, recording your 152nd take on a backing vocal because you still can’t get it right, filming a reality TV series about your dysfunctional kerr-azy family or twitching in a gutter outside a nightclub after overdoing the Columbian marching powder, you’re more than likely you’re on tour, spending months away from your home and family. This hardly seems like the behaviour of a conscientious dog owner. We all know that your pet needs love and attention, not to mention feeding, watering and exercise. Luckily for the average rock multi millionaire, he’ll have hired help on hand to assist with the day to day care of his pet, whether it’s an elderly English retainer or a young Filipino manservant. This leaves you free to pose with your pooch for photographs for Hello’s exclusive 8 page spread of your brand new Hampshire mansion. Of course, this is a sweeping generalisation. In a profession where image is everything, sycophancy abounds, teen idols have a shelf life measurable in weeks and talented people never seem to get the success you think they deserve; the unquestioning loyalty and friendship that your dog will give you can be beyond compare. 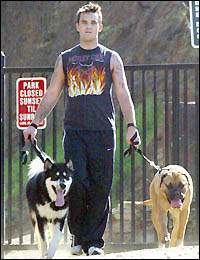 Let’s have a gander at some of the more famous warblers who have a pet dog.